How Does Kagan Feel About the Military? In 1996, well before Kagan’s tenure at Harvard, Congress passed the Solomon Amendment. The measure essentially allowed the government to deny federal money to higher institutions that refused to allow military recruiters on campus. A group of law schools (FAIR) decided to band together in 2003 to fight the Solomon Amendment. 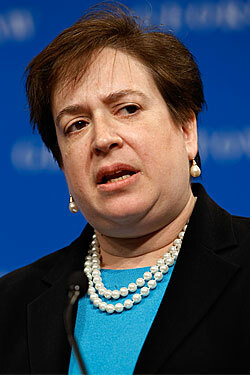 Though Harvard was not a member of that association, Kagan did sign on to a brief in support of overturning the ban. The case went all the way to the Supreme Court, where FAIR lost in a unanimous decision – allowing the government to continue blocking funds to schools that ban military recruiters. Though Kagan allowed military recruiters onto the campus she expressed “regret” at doing so. Kagan supporters say she has always made clear that while she objects to DADT, she has great respect for the military and those who serve in it. Robert C. Clark, the man who preceded her as dean at Harvard Law School says it would be “very wrong” to portray Kagan as hostile to the military adding, “Quite the opposite is true.” David Axelrod, senior adviser to President Obama, says Kagan’s actions at Harvard simply upheld the policy that was already in place when she took over as dean. Axelrod also notes that Kagan was “extremely supportive” of students who wanted to enlist in the military. Both sides are eager to see how members of the Senate Judiciary Committee will question Kagan on the issue. Will her confirmation hearings be dont ask dont tell? Barts sister? Where is the segway? I predict she will not be confirmed. What open baggage she has, is bad baggage. And, Heck loves her, so obviously, she is awful.